It took me awhile to earn money online. I tried multiple ways to make money online. I was running from pillar to post in order to find best legitimate ways to earn money online. Are you in the same boat like me? Do you want to earn money online? Did you ever tried to make money online but did not got success? Don’t worry. I have something interesting for you. In this post, I will share 20 Ways to Earn Money Online from Home without Investment. As an experiential authority, I can say that you can also earn thousands of dollar online by just doing some legitimate activities online. 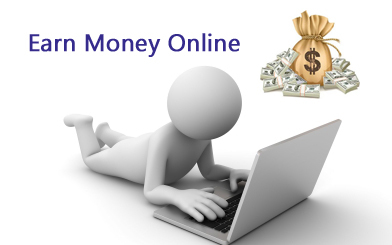 You just need an Internet connection, Laptop and few legitimate websites that can offer you avenues of earning money online. If you are hardworking and serious about making big money online, affiliate marketing is for you. In affiliate marketing, you are helping customers to select a right product. Follow the steps given below to earn money online from Affiliate Marketing. Sign up as a partner on the merchant sites like Flipkart, Amazon, eBay, Clickbank, CJ etc. Get affiliate link for various products. Start promoting products via affiliate links on your website or via E-mail marketing. You will be paid 4% to 20% commission if someone purchases product by using link shared by you. You can earn Rs.10000 to 1 Lakh by Affiliate Marketing. Google Adsense is second proven way to earn money online. It is one of my favorite ways to earn money online. However, it is not easy to make money from this way. You need to invest a lot of time with a dedication to generate money from this idea.Follow the steps given below to earn money online from Google Adsense. Make a website or blog with high-quality content. Once your website gets popular apply for Google Adsense account. If you get an approval from Adsense, you can generate an advertisement code. You need to place this code on your website to generate money. You can generate $100 to $10000 from Google Adsense. If you are running out of time and you want to generate small income say $100 per month you can start with PTC sites. PTC site means Pay to click site. These sites will pay you money for clicking and viewing an advertisement. The pay-out for clicking advertisement is very low hence this idea is on the third position. There are many legitimate websites where you can register and start earning money without any investment. My favorite PTC site is Clixsense. GPT Sites is another interesting way to earn money online. I have generated a lot of money using GPT websites. GPT means Get Paid To. These type of sites provides various tasks such as survey completion, playing games, clicking ads, completing promotion offers etc. My favourite GPT sites are Swagbucks, InboxDollars and CashCrate. If you have extra time you can earn more money by solving Captcha on Captcha Solver websites. You just need to solve a captcha and you will be paid money for solving each captcha. You need to be fast in solving a Captcha to generate good income. I have used CaptchaTypers and MegaTypers websites for earning money by solving captcha. If you love to give an opinion about various products survey sites are for you. Survey Sites offers you a small survey which you can complete in 5 minutes to 30 minutes. Along with fixed questions you need to write your feedback and opinion in a survey. You will be paid $1 to $5 from a single survey. I have used Swagbucks to earn money from the survey. Freelancer is a popular way to make money after PTC, GPT and affiliate marketing. As a freelancer, you need to complete, a fixed work assigned to you online. You can earn $500 to $1000 by becoming a freelancer. Freelancer task includes web designing, programming, video making, graphic design, data entry etc. I have used Fiverr and Upworks and earned lot of money as a freelancer. The Content writer is next idea of earning money online. If you are good at writing you can start online writing business and earn a lot of money. This idea can help you to earn $500 per month. Elance, Freelancer, and Copyblogger are websites that can offer you online writing jobs. You can even tie up with bloggers who are looking for web content writing services. Youtube also offers an opportunity to earn money online. The process is very simple. Select a topic and create a Youtube channel. Generate videos by using good quality camera or software. I use Videoscribe for making videos. Upload Videos on a channel. Apply for youtube channel partner program to make money from videos. Web Design is a most popular way to make money online. You need to have the technical knowledge and programming skill to become a web designer. If you don’t have an idea then you can take the training & then start this because this field has got a great potential. You can promote your business offline or even online by creating your own website. SEO stands for search engine optimization. It is a technical term used for improving search ranking for a website. It is a booming field. If you have the knowledge you can become SEO expert. As an SEO expert, you can earn $1000 to $2500 per month based on your expertise. You need to bid project online or contact companies looking for SEO services for their website. Online E-Commerce site is another way to earn money online. However, it requires lot of investment to start your own e-commerce portal. I would recommend starting e-commerce store on a smaller scale with specific items or within a city. Once you are successful you can expand the scope by making an investment. Domain Trading is next way of earning money online. However, it demands some investment for buying domains. You have to be expert before starting domain trading business. You have to develop skills to identify domain name with future demand. You have to purchase a domain name with low price and sell it at a higher price. You can use Godaddy Auction tool for this. Domain and hosting service is an online business idea for people with great technical knowledge. This business can be done in two way. You can either setup your own server or start domain and hosting services or you take service from existing service provider as a business partner. It is proven way to earn money online. However, it will take time to generate money from this idea. Stock Market Trading is a most promising way to make money online. However, you need to develop a skill for starting stock trading. You can refer to my earlier post which gives information about starting a career as a stock market trader. You can earn money from your smartphone. There are various apps available online that can help you to make money on the move. You need to complete few tasks and survey to make money from these apps. I have used InboxDollars to earn money online. Good photos of nature, place, people, home, things are always in demand. These photos are largely used for making advertisements. If you are good at taking photographs you can sell them online and earn money. Follow the steps given below to sell photos online. Register on the websites like Photobucket, iStockPhoto or Shutterstock. Upload your unique photographs with a price tag. When someone purchases your photo, you will get paid. If you are good at teaching you can start an online tutorial business. In this business, you need to create content for the specific course online and create a subscription model for usage. It could be module wise cost or even usage wise. The last way to earn money online is by selling old stuff. You might have a lot of unused stuff at your home. You can sell this online and earn good money. You just need to identify old unused items and upload high-quality photographs on websites like OLX or Quikr. However, this way is not sustainable. As it is difficult to find out old items every month. I hope above 20 Ways to Earn Money Online will help you in generating online Income.